The figure given above of Pakistanis in Germany includes only people holding a Pakistani passport. German citizens of Pakistani origin or descent are not included. Pakistani-Germans refers to the ethnic community in Germany of Pakistani heritage or descent. Germany is understood to have the concentration of South Asian Muslim Scientists in Europe. Roughly every fifth Pakistani in Germany (21%) has been living in Germany for over 15 years. Just over 25% or around every fourth Pakistani living in Germany today came to Germany less than four years ago. Many young Pakistanis have come to Germany recently as students of science and technology from /in prestigious universities. German Government has established German Academic Exchange Service in Islamabad. These highly educated Pakistanis are serving in various sectors of the German economy. According to Statistisches Bundesamt Deutschland 1,116 Pakistanis were naturalized as German citizens in the year 2006. Almost a third of all Pakistanis in Germany live in Hesse. There are approximately 1900 Pakistanis living in the northern city-state of Hamburg, about 1500 in Frankfurt am Main and almost 1400 in Berlin and its suburbs. In 2009, the German government estimated the number of people of Pakistani descent residing in Germany at 76,173. Pakistanis have been attracted to Germany because of its low university tuition fees. This is a significant incentive, as some Pakistani students from middle income groups who find it expensive to study in places like the USA, UK, Canada and Australia. The Government of Pakistan through its Higher Education Commission has also sent hundreds of Pakistani researchers and scientists for training in German universities. Most major German universities have Pakistani student societies. Hundreds of institutes in Pakistan teach students German as their primary foreign language as part of an effort by Germany's top technical colleges to attract more Pakistani students. A recent study by Germany's Federal Employment Agency concluded that Pakistanis have been the most successful at finding work in the EU country over the past couple of years. Most Pakistanis in Germany are Muslim. There are many Pakistani Ahmadi Muslims, Hindus, Sikhs, as well as a strong Christian community. 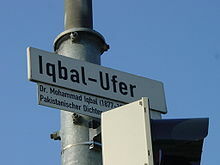 Street named in Muhammad Iqbal' s honour in Heidelberg, Germany. Most of the Pakistani who come to Germany are highly skilled professionals including academics, scientists, doctors, engineers, information technology professionals and journalists. The tradition of Pakistanis coming to Germany for higher education was pioneered by the philosopher Muhammad Iqbal. In 1907 Iqbal traveled to Germany to pursue a doctorate from the Faculty of Philosophy of the Ludwig-Maximilians-Universität in Munich. Working under the supervision of Friedrich Hommel, Iqbal published a thesis entitled The Development of Metaphysics in Persia. Jamal Malik, Professor of Islamic Studies and chair of Religious Studies, University of Erfurt, Germany. Hasnain Kazim, author and journalist, correspondent of the German news magazine DER SPIEGEL and SPIEGEL ONLINE. ^ e.V., DAAD Deutscher Akademischer Austauschdienst (4 November 2011). "DAAD-Information Centre Pakistan - Welcome to the Website of DAAD in Islamabad!". ic.daad.de. ^ "Startseite - Statistisches Bundesamt (Destatis)". www.destatis.de. ^ "PSA RWTH Aachen". www.psa.rwth-aachen.de. ^ Faisal, Sardar. "Home". Pakistan Students Association - University of Duisburg-Essen پاکستان اِسٹوڈنٹس ایسوسی ایشن - یونیورسٹی ڈوئسبرگ ۔ ایسن. ^ "Iqbal's "Development of Metaphysics in Persia" PhD thesis" (PDF). This page was last edited on 6 April 2019, at 13:08 (UTC).